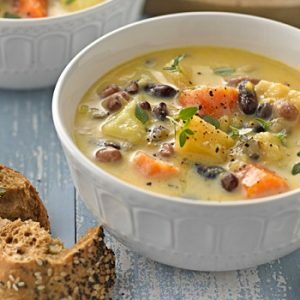 This homemade soup is packed with nutrients, offering three servings of vegetables, plenty of fibre, and more than a third of your daily intake for most vitamins and minerals per bowl. You can prepare it in under an hour and it serves 4. 1 Heat the oil in a large saucepan then add the garlic and onion, frying over a medium heat for 5 minutes or until soft but not coloured. 2 Add the prepared swede, carrot, parsnip and sprigs of thyme, then stir to combine. 3 Add the stock and milk, bring to the boil then simmer for 15 to 20 minutes until the vegetables are tender. 4 While the vegetables are cooking, drain the canned mixed beans into a colander and rinse. 5 When the vegetables are tender, remove from the heat and put one-third into a food processor or blender, then blend until smooth. 6 Return the blended mixture to the pan, add the beans, stir and warm through over a low heat. 7 Season the soup with black pepper to taste. 8 Serve the soup in bowls with half of the French baguette per person.